I suppose that this is really a blog, though I hesitate to call it that. The real bloggers seem so much more interesting. I cover stuff which I find interesting, and I hope that you will too. For more information about what I'm interested in, see the Ponding pages. We just returned from Charlotte, NC to watch our niece (Olivia Churchill - GBR) compete in the Junior Wildwater World Championships (Kayak). She ended up with 2 bronze medals for individual classes, and one gold for a team class. 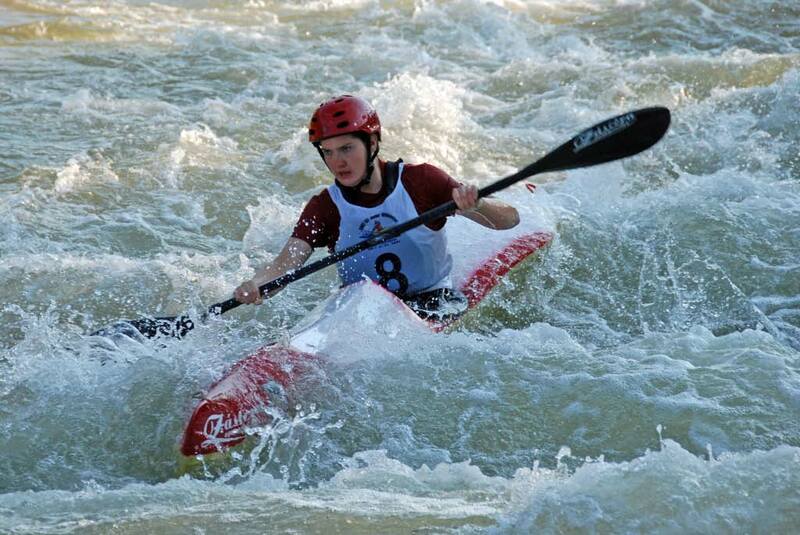 The Charlotte races were held at the US National Whitewater Center which has a completely manmade course suitable for the short sprint races. Apparently the water is swimming pool clean -- and there are some enormous pumps that pump it round to generate the raging torrent to kayak down. The photo shows Olivia on her second run (the sprint races involve adding the times from two runs together) which led to one of her bronze medals. USAir managed to cancel our (8 am) flight down to Charlotte on Friday morning and couldn't get us there until 8pm -- by which time we had missed the team race. For a full trip report from my sister's point of view (she was travelling with the British team), see her trip report. I have worn a Tilley hat (a size 8⅛ T3) for 15 years or so, and it finally wore out after too many visits to the washing machine. I wanted to get a couple of new hats, so I got the catalog, and measured my head, and ordered two (a TH5 and an LTM6). I was somewhat suprised that the sizing guide ended up with me being a 7�. Of course, the hats showed up and were too small -- well, actually they fitted on my head, but were too tight (they are supposed to be held on by gravity and not by pressure on the forehead). I shipped them back, asking for a size 8 (which is what my old T3 had shrunk to). On a whim, I put the tattered remains of the T3 in the box, along with a note requesting replacement. I know that they say that their hats are warranteed for life, but I had no idea if it would actually work. Imagine my suprise, when, a week later, a box arrived with three size 8 hats: T3 (replacement for my 15 year old hat), and the correct sizes of LTM6 and TH5. These guys come highly recommended. Since I managed to get content-compression working on my web server (which was way harder than it ought to have been), I have noticed that most of the web crawlers do not make use of it. However, the googlebot and Yahoo Slurp both do enable compression, so it is possible. I have started sending email to all the contact points that I can find when spiders reach my website. One implemented compression within hours, one discovered that they had a bug which prevented it from working, and a couple more are looking into implementing it. The rest have yet to reply. I have now built an automatic Hall of Shame page that lists the current sinners. What you don't see from this page is that many crawlers do support compression. The suprising thing is that some flavors of IE 6.0 don't appear to do compression. The ice has finally melted from the pond, and all the snow has gone. Our thoughts are turning to spring and summer projects -- including ice cream. We have put together a list of Birthday Icecream Flavors that tell you what your special flavor is, based on the your birth month. We received 13.5 inches of snow today. I guess that the snow started at about 7 AM. At 8 AM we had between 1 and 2 inches. We then received another 12.5 during the day till it tapered off at about 4 PM. The total is 13.5. You may wonder how that can work out -- it is because the later snow compresses the earlier snow. See the Snow Measurement Guide for the full gory details of how snow measuring should be done. If you are interested in measuring snow, then check out CWOP Snow Measuring to see what you need to do. The major problem with performing these measurements (apart from having to go outside in the cold weather) is trying to find a suitable ruler -- it should be marked in tenths of an inch. These are very hard to come by in the US. A family friend (Laurel McSherry) entered the national competition for the Flight 93 Memorial that will be built. She got through to the final round, and is one of the five finalists. I urge you to visit the Flight 93 Memorial Project site where they have details of the final round projects. Laurel's project is 'Fields, Forests and Fences' -- I like it, but I did get a personal pitch as to its merits! I particularly like the fact that each visitor gets the chance to leave their own message behind -- in the form of a tag attached to a specially designed fence. As a side note, the website is (I think) poorly designed. It is difficult to figure out what are links to more detailed information, and some of the PDF files have been converted in such a way that you cannot actually read the text. Also, when I tried to leave a comment, I got dropped into an administrative interface to all the comments (though I couldn't actually make it work). 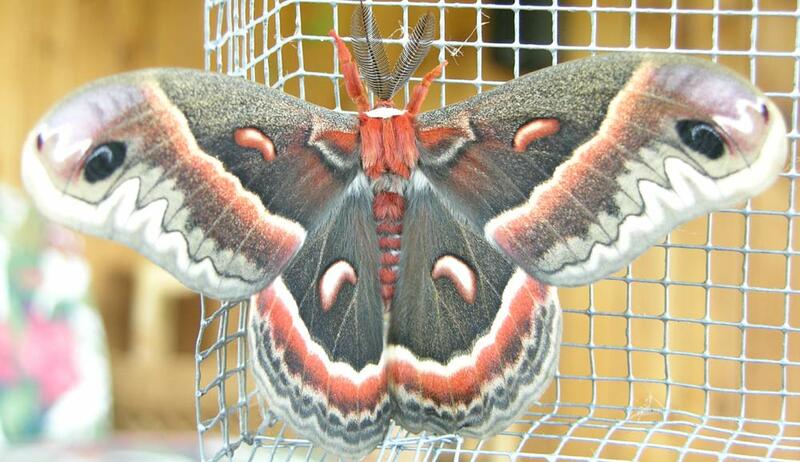 The female crecopia attracted two males to the screened porch where she was being kept. At least one of them was wild (as I had only released one male at that point). More interestingly, the wild male that hung around was significantly larger than my captive raised ones. I suspect that I was not feeding the caterpillars the right food. In particular, I have been told that the trees that I thought were Cherry are actually Pear. The female then mated for almost 24 hours (not bad to mate for 10% of your lifespan). I have now put her in a paper bag to lay her eggs. Today two polyphemus eclosed. This is the female (you can tell by the thin antennae), and I let the male go. We will see if she attracts a mate overnight. 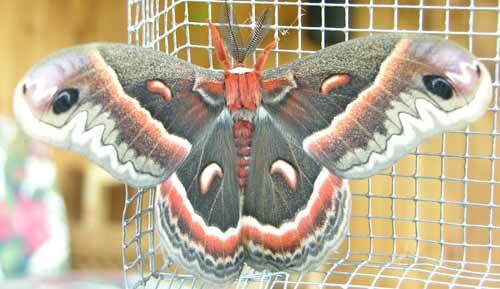 Today, three Cecropia moths eclosed (aka hatched). I got the caterpillars in June 2004, watched them grow, and then make their cocoons in the late summer of 2004. Suprisingly, they survived the winter and are now emerging. Yesterday, I had a single male, and today two more males and a female. The photograph is of one of the males. The wire netting he is sitting on has quarter inch squares, so you can get some idea of the scale. Yes, they have a 5-6 inch wingspan. The males want to fly off and mate, and the females just hang around for the males to arrive. Unfortunately, we had over an inch of rain this evening, so I haven't put the males out to fly. They are native species here in New England, so they may find a mate and start another cycle. I was given a couple of bluebird boxes for Christmas, and I finally got around to mounting them in the yard. Of course, they are supposed to be spaced 100 yards apart (and 100 yards from my other two bluebird boxes). This design rule went out of the window! The collected Internet wisdom was that the entrance hole should be deep to keep out predators -- so I screwed a piece of 2x4 to the front (with the approved 1.5 inch hole). Why don't they come that way? For the last three days, I have evicted a sparrow from one box (by removing the start of their nest). This morning, the other nest box had a pair of bluebirds popping in and out. Not (yet) building a nest, but scouting out good locations. I had intended to mount a camera in one of the boxes so that we could watch what was going on -- I'll have to move that project up the priority list. GEOURL is a neat website that has come back online after a long period of downtime. It allows you to find websites by geographical proximity. For example, these are the websites near me. I notice that DeviantArt has local users. I must confess that I really don't understand it, even though my niece has a gallery. Open source server for the Rio Receiver -- this is what I use. The Citizen Weather Observer Program is a loose collection of amateur weather station operators. The Doc Searls weblog -- he seems clueful and I read him. Neat description of the Gunnera Manicata -- a truly monstrous plant!